2018 marks the 150th anniversary of the classic Little Women by Louisa May Alcott. 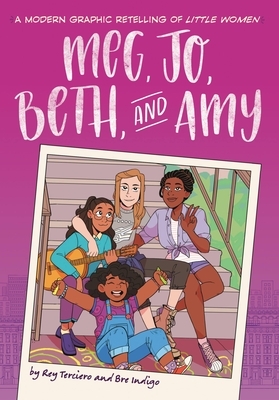 Join Meg, Jo, Beth, and Amy as they are reenvisioned as a blended family living in modern day NYC in this beautiful, full-color graphic novel that's perfect for fans of Raina Telemeier's Smile, Svetlana Chmakova's Awkward, and Victoria Jamieson's Roller Girl. Rey Terciero, also known as Rex Ogle, has written and edited hundreds of books and comics for children and young adults. He is a queer writer who has always been drawn to strong female protagonists, including Elizabeth Bennet, Princess Leia, Jean Grey, and Hermione Granger. Meg, Jo, Beth and Amy is his debut graphic novel. Bre Indigo is a lover of astronomy, salmon sashimi, and open minds. She tells stories of gentle boys, tough girls, and those in between with a focus on tolerance and the many faces of love. Meg, Jo, Beth, and Amy is Bre's debut graphic novel.